Kobusher is a late bloomer in the Manila art scene. Spent most of his career in advertising but never lost his first love which is painting. He took up Fine Arts (major in painting) at the University of the Philippines but most of his influences came from pop culture. 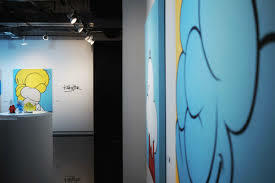 Being a child of the 80’s his visual narrative was honed by Sesame Street, Keith Haring, Lee Quiñones Run Dmc, and MTVs. In 2015 he literally walked out from his work and decided to stick it to the man. He felt that he has done everything he can as an artist during his stint as a Creative Director in one of Philippines' top agency, and decided that it’s now time for the next phase of his career. One by one he was able to produce a series of paintings for a show. Secret Fresh Gallery in the Philippines gave him his first break, and in January of 2016 his first solo show. Which incidentally sold out. Kobusher is a staunch believer that nothing comes from luck, but having a first solo exhibition, and a sold out show, for a first time artist will make him rethink his canon.